Hannibal may be behind glass, separated from Will, but they’re still a family, whether Will wants them to be or not. That’s the narrative that Hannibal pushes throughout their initial meetings about the murders committed by Francis Dolarhyde. “Family values have declined over the last half century but we still help our families when we can. You are family, Will.” The title of this episode, “And the Clothed with the Sun…,” is apt for an episode about family because in William Blake’s painting (that Dolarhyde is obsessed with and takes on as his alter ego) and, in turn, the Book of Revelation in which the painting is inspired, the “Woman Clothed with the Sun” is a mother. She gives birth to a baby that the Red Dragon seeks to destroy, starting a great war. She’s likened to the Virgin Mary, this ultimate mother figure of a savior. 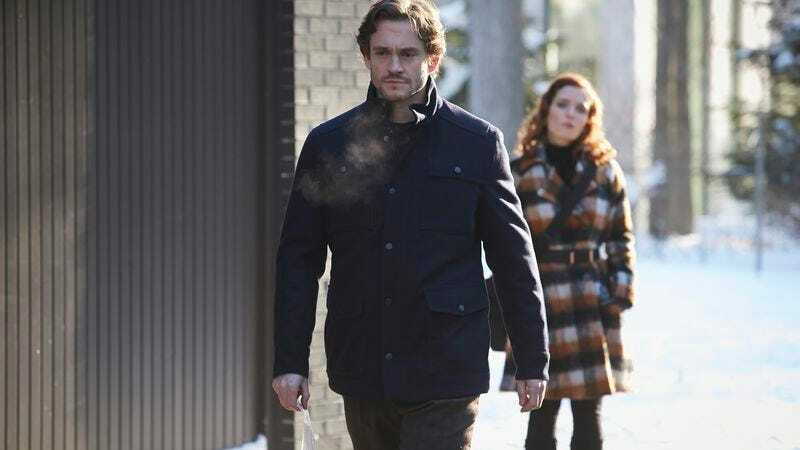 As Hannibal reminds Will, he gave him a child once, Abigail Hobbes who returns animated in Hannibal’s mind palace, filling in scenes that had been left up to explanation while other action was taking place. He treats her like a child, we see him wrapping up her arm as if he’s putting a band aid on her knee after, he puts her hair behind her ear, he helps her off the counter and teaches her about blood splatter. But more importantly, he gives her a rebirth. Families love in their own way, Hannibal reiterates, and any kind of love is welcome. His love, unfortunately for Abigail, take the form of killing her the same way her father did. That is how he showed his love. He might give her rebirth, but he also gives her death. Francis’ need for family is alluded to in the dinner scene with his grandmother (for those aware of the source material, they know the story but I’ll refrain from repeating in case the show explores that too, which is likely considering how heavily this episodes relies on familial themes). He places mirror in his victim’s eyes and mouth to see himself in them, to see himself in these families as well. But in “And the Woman Clothed with the Sun…,” he’s also beginning to interact with the outside world, not just with his inner dragon (although, the scene where he grows his tale was quite striking). He meets Reba McClane (True Blood’s Rutina Wesley), a blind woman who works at the same film processing plant. She wants want no pity for her condition, and receives none from Francis. Where they work is important. Reba works with an entirely visual medium but she cannot see any of her work. Then again, she can work in darkness and it does not matter. Francis is a man so disgusted with his own image, yet he works in place that reflects human faces. Then again, he can spend his time looking at others. Jack’s involvement in this episode is particularly interesting. He has ostensibly been on the side of good throughout the three seasons. Jack may have pushed Will into doing things that were dangerous for him, but they always seemed to serve the greater good. But his final scene with Hannibal revealed how something a little more manipulative. Before, his motives were consistently out in the open. But now, he’s being considerably sneakier in the service of catching the Tooth Fairy. He’s the one who tells Freddie Lounds (welcome back, Lara Jean Chorostecki!) about Will’s reconnection with Hannibal (“It takes a killer to catch a killer,” he tells her). Jack is massaging the investigation behind the scenes, putting people in danger and learning little from the past. I must reiterate again: I am so into Alana the Badass. Her outfit — that white vest and striped blazer — was impeccable. And I loved how she is taking on this role of jailer. Unlike Chilton, whose role she has taken over slightly, she doesn’t do it for ego, she does it for protection. She knows what will hurt Hannibal the most — “I know what you’re afraid of. It’s not pain or solitude. It’s indignity.” — but she only brings that out when Will returns to the picture and she wants to save him from returning to what he once was. Okay, doesn’t murder husbands sound kind of adorable? I’m interested how they deal with Freddie Lounds interaction with Tooth Fairy. In the source material (spoilers to follow), Freddie dies in the same way she fakes her death in “Ko No Mono” to trick Hannibal. Perhaps she was going to be kept alive for the promise of future seasons (sob!). “I love a good finger-wagging.” “Yes, you do. How is Margot?” What an incredible piece of conversation.